This is a continuation of my serial reviews of the Supreme 90 Day program. All S90 work outs use a common warm up and cool down. 4 super sets of 2/3 exercises, repeated 2 or 3 times in succession with a brief demonstration before the set begins. Get fit in 90 days flying through workouts with me! 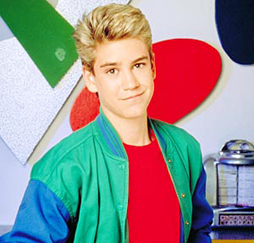 The fitness model Mark is Zack Morris on steroids. His dad might be Laser from American Gladiators. This work out had some of the same problem as Chest & Back where everyone is racing through at different speeds except one guy who is going normal pace and the 3 other people are waiting on him to finish Mark/Zack Morris is the winner of the “race”. The demo before the super sets gives you at least a chance to catch up before the next one starts. The model Mark is the most annoying. He is the buffest looking guy out there and he’s doing clean & jerks with 15lb dumbbells so that he can rocket through. If I had to summarize the workout it would be Cleans & Pushups. There is the beginning core set with some crunches and plank core work, but each other super set has a variation of a clean (clean, clean and jerks, clean jerk and press), a squat and a pushup and one plyometric move (plyo pushup, squat jumps, broad jump). It was a pretty good workout. Total body mostly ends up being back, shoulders and thigh which is an important set. The plyometric was there just to make you a little more tired. Overall I thought this was a good morning workout. It lasted just long enough to break a sweat, but not so much that I’m going to sweat profusely for the rest of the day. The main reason I took points off was the pacing being so fast. Similar to Legs & Back (except with cleans to work out your back instead of pull ups) and there was a little bit of the old Plyometrics. S90 Total Body didn’t have enough plyo to replace the P90X Plyometrics. If you hate pull ups and like cleans then S90 is the way to go. I eat pull ups for breakfast so I give the nod to P90X. I also like my plyo an hour long and separate. Next Next post: Web 2.0 I sort of get it now.